Pacific Shoji Works was created in 2011 by Tim Roberts. 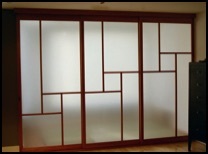 I started my shoji building in 2000 and was a long time partner with Glen Collins at Hana Shoji and Interiors. After 25 years of Shoji building Glen decided to retire and we closed Hana Shoji and Interiors. 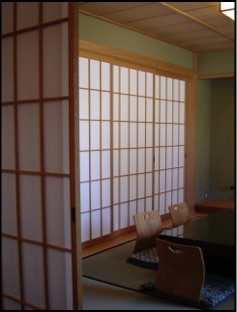 Pacific Shoji Works will continue the tradition and expertise of crafting exquisite, custom-made Shoji Screens, Fusuma, Amado, and Capiz Shell panels for your home or commercial space. All of my work is custom-built, made to order. I am not a production shop and do not carry any standard sizes. Most of my work is residential through direct contract with the homeowners. Generally I can provide a quote over the phone or by email with a little information from you. •Approximate dimensions (width x height measurements) for the opening/space you would like to cover. •If possible via email, providing me a picture of your space is very helpful. •What is the application of the panels? 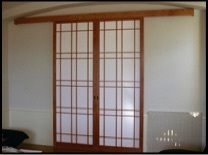 Closet doors, window/door coverings, room partition, etc. •Is Installation or crate/shipping needed? •Do you have any particular design in mind perhaps something I have done already or something you have seen else where, wood species, materials, functionality, etc? If you prefer an in person conversation you are welcome to make an appointment to visit my shop and we can discuss your project. If an in-home consultation is need there will be a $150.00 charge, which will be credited to the order amount if an order is made. Once a quote has been giving you can decide if you want to move forward and be added to my waitlist. The waitlist is a first come, first served basis. There is a $150.00 non-refundable charge to be added to the waitlist. This charge counts towards your final price for your project. At this time you are not pinned down to any details until the deposit is made. You will be contacted back as I get closer to being able to start your project. I will arrange a time to meet with you onsite to see your space, get measurements, and to go over all the details, and finalize everything. An invoice for your project will be completed and a 30% deposit is need at this time to get started. Since every project is as individual as it’s owner and situation, its impossible to give exact date of completion. Generally speaking the turn around time from the date of 30 % deposit to installation has been 4-6 weeks. The remaining balance is due after installation. If for whatever reason when your time comes up for me to begin building and I can not start your project, I move on to the next projects in line. You will need to contact me when you are ready for me to start in which I will do my best to accommodate you and work you in to my schedule at that time. Softwoods -- red cedar, clear vertical grain fir, and hemlock, Hardwoods -- red & white oak, maple, cherry, walnut are the most popular woods I use. I use sustainable woods and eco-friendly materials whenever possible. Insert materials include Japanese Shoji paper, SynSkin (white-fiberglass), Capiz shells, acrylics, laminates, and glass. All of my panels are finished by hand with clear oil and wax. All other finishes are available at an extra cost. Shoji and Fusuma generally fall in the range of $45 to $65 per square foot. Traditional made yuki-mi Shoji range from $65-$75 per square foot. 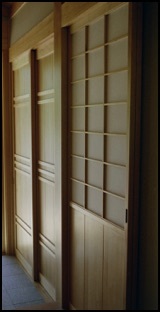 Amado doors range from $65-$75 per square foot. Capiz shell panels can range from $75-90 per square foot. For smaller projects there is a minimum charge of $900. Prices vary by installation, size of job, designs, type of wood, and type of insert material. With so many variables, I suggest you contact me for a quote. All California residents are subject to California state sales tax. Less but Better. I focus on one project at a time, start to finish. Doing things this way results in a waitlist and slower turn around times, but it allows me to be able to give my full attention and to do my best work for each customer. I like the human to human interaction, customer to craftsman. I offer a complete package, from design consultation, to measurements in your home, to custom manufacture, to installation of my products. I have always felt it is one thing to make shoji; it is another to make them work and fit properly. For that reason I prefer to do my own installations, with skill and confidence honed by 18 years of experience. 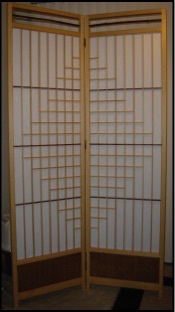 As a result the bulk of my custom Shoji Screens, Fusuma, Amado, and Capiz Shell panels are done in the San Francisco Bay area.